The final art design and sound master mix were sent to DiscMakers for pressing today. This is the sixth music project by Vic Sadot where he worked with DiscMakers. It is the fourth that included the CD Baby digital distribution deal. Click here to see a 3D preview of the cover-art at DiscMakers for the new 2016 “Truth Troubadour” CD release by Vic Sadot! Here is a screenshot too! Update DEC 9, 2016: If you click on the cover art below, it will take you to the Truth Troubadour CD at CD Baby. Vic Sadot DiscMakers Discography Product Releases Since 1985: (1) 1985 “Good Time Delaware” 45 single by Crazy Planet Band, cover art by Michael Schwartz & Debbie Hegedus; (2) 1988 “Ride the Wind” LP by Crazy Planet Band, cover art by Curt S. Wayne; (3) 1997 “Comin’ Home” CD by Vic Sadot’s “Planète Folle” Band, CD cover photo by Geoffrey Williams; (4) 2005 Vic Sadot “Broadsides & Retrospectives” CD cover photo & design by Dean A. 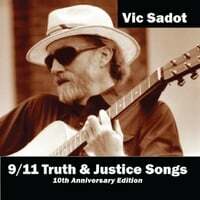 Banks; (5) 2011 “9/11 Truth & Justice Songs” CD by Vic Sadot, cover photo by Geoffrey Williams, cover design by Michael Tank; (6) 2016 “Truth Troubadour” CD by Vic Sadot. Rob Sadot in the studio during his visit to California in October 2012. We did “Full Spectrum Dominance” and “Billboard Bandit” with Eric Golub on violin at that session with Owner/Sound Engineer Sammy Fielding of Ancient Owl Audio (formerly Robot Envy Studio). Truth Troubadour CD Credits: Vic Sadot on vocals and acoustic guitar on all 18 songs; and on piano accordion on 9, 12, 14, 17. Eric Golub on viola 2, 3, 4, 6, 7, 10, 11, 14, 17, 18; violin 2, 12, 13, 15, 16; ukulele on tracks 4, 5, 9, 11, 18; baritone ukulele 14 and 17. Rob Sadot on electric guitar on 1, 13, 15. Dean A. Banks on piano/bass on 1. Rob Hunter on drums/recording engineer at The Tune Room in Wilmington, DE on 1. All other recording/mastering by Sammy Fielding at Ancient Owl Audio in Berkeley, CA. Back cover photo by Cecile Earle 7-22-16 Redwood Gardens. Front Cover & CD Design by Vic Sadot.